What is it about Time Warner Cable Arena here in Charlotte, N.C., that just doesn’t agree with the Raptors? The players can change. The coach can change. Hell the team name can even change but what doesn’t change is the Raptors come here looking to take advantage of a deeper and more athletic lineup but can’t do so. This one was a 103-94 final in Charlotte’s favour that actually looked much better than the actual separation between the two teams. 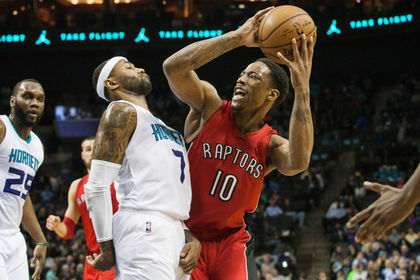 For the eighth time in the past eight visits here, the Raptors arrived the favoured team and for the eighth consecutive time were trumped by the hometown Hornets. Kemba Walker may be sideline, which was a big chunk of the Hornets already limited offence, but for the past six weeks, newest Hornets point guard Mo Williams has been filling those shoes admirably. Williams had 19 points, including four makes from distance that matched the entire Raptors output for the night. When Williams wasn’t filling the basket, he was finding good friend Al Jefferson for easy buckets at the rim. Jefferson finished with 23 points to lead all Hornets. There were plenty of testy moments in this one. First with Jonas Valanciunas and Michael Kidd-Gilchrist and then with Kyle Lowry and Cody Zeller resulting in a season high for a Toronto game six technical fouls. There were some early indications that this one might not be a smooth evening for the visitors. For one there was the significant turnover in the starting five. In one game, the Raptors swapped out 2/5 of the starters from the previous three games. Back was Kyle Lowry after a three-game absence to regain some of that pep in his step that had gone missing after carrying the team through the six-week absence of DeMar DeRozan. But the Raptors also opted to bring Terrence Ross back into the starting unit after a 21-game absence. Even with just Lowry returning, Raptors head coach Dwane Casey knew there was every likelihood for some initial returning pains. Casey said all that before revealing just before game time that Ross too would be returning. It was no coincidence that with all that change came a very uneven shooting night for everyone in a Raptors uniform not named DeMar DeRozan. DeRozan who has been back in rhythm for the past two games remained there, but every other Raptor was hard-pressed to make more than one of every four. The only other Raptor to even get into double digits in scoring was Lowry and he was just 5-of-17 on the night. As a team the Raptors shot a woeful 40.7% from the field and made just seven of its 22 three-point attempts. Even those numbers were skewed by a trio of late threes by Lowry, who at least left the game having seen his shot go down with some consistency if only over the final few minutes. Lou Williams, Mr. Instant Offence off the bench, had one of his off nights making just one of his nine attempts from the field and missing all four of his long-distance attempts. Vasquez, who was back with the second unit after filling in so admirably for Lowry, was off as well. Ross had two of the team’s seven three-pointers but missed on five other attempts. It was a collective poor night of shooting pretty much all around for the visitors in red. The Raps will get one more chance about a month from now to get this Charlotte monkey off their back. Eventually something has to work for them here. The team will remain in Charlotte overnight practice on Saturday. Who knows? Maybe that will change their luck because right now there isn’t a lot of luck in this city for them.